Nigeria international Francisca Ordega has become the latest African to move to the Chinese Women's Super League after signing for Shanghai W.F.C. 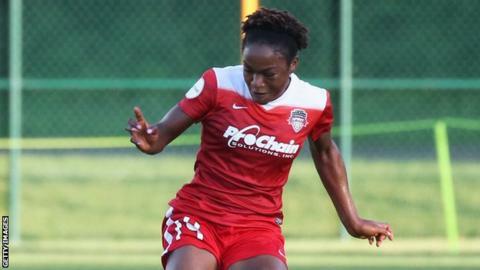 The forward, 25, has joined the Shanghai club for the 2019 season from United States' National Women's Soccer League (NWSL) side Washington Spirit, where she made 63 appearances in a four-year spell. Ordega's deal was announced shortly after Thembi Kgatlana and her South African compatriot Linda Motlhalo also moved to China. She scored twice to help Nigeria win a ninth Women's Africa Cup of Nations title in December and made the final three for Caf's women's Player of the Year award for 2018. She starred as her country secured an eighth Women's Africa Cup of Nations title in 2016. Ordega, who has represented Nigeria at all international levels, has 34 caps for the Super Falcons and also boasts experience at two Fifa Women's World Cups in 2011 and 2015.